Yesterday afternoon I'm at a locally owned and independent coffee house, flipping through the Sunday paper. Seated at a table near to me, well within eavesdropping distance, are three individuals that-before I even sat down-I immediately knew were Liberals. Mom was an older lady seated next to, I think, her son who was there with his girlfriend or wife. None of them looked as if they were too familiar with soap and water. Suddenly, something offensive presented itself to "Ma" and the "Other Gal". 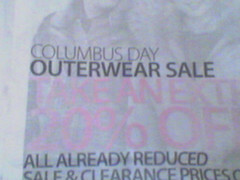 As they flipped through the local Sunday paper they were offended by a half-page Macy's Department Store Ad, titled: "Columbus Day Outerwear Sale". Why, didn't Macy's know that Columbus was a mass murderer, the two ladies asked each other aloud? Then they whipped out their respective cell phones. One called Directory Assistance and I heard her ask for Macy's telephone number. The next thing I knew, both Ma and The Other Gal were trying to get through to Macy's Customer Service Department to voice their displeasure about promoting an outerwear sale using the name of the explorer. "I want Macy's to know that we here in Minnesota don't celebrate Columbus Day. Columbus was a mass murderer. Did you know Columbus was a mass murderer,"intoned the Other Gal speaking to whomever the poor individual was fielding Macy's incoming calls. Ma was busy with her phone, repeating the same talking points to the Macy's rep on her line: "We don't celebrate Columbus Day in Minnesota. You do know Columbus was a mass murderer, don't you?" Well, sorry to burst your bubble there, gals, but we most certainly do celebrate Columbus Day here in good ol' Minnesota. See if your local and state government offices are open today. Guess what - they're not - they're closed in observance of Columbus Day (GASP!). So, Maaaaaaaaa...So Other Gal...(to his credit, the balding-pony-tailed male with them did not partake in Macy's Outerwear Columbus Day Sale outrage, preferring to surf the web on his laptop), we do indeed celebrate and observe Columbus Day here in Minnesota. Just try and get those state and local government workers to give up their paid Columbus Day Holiday! Ain't gonna happen. Later, Ma and Other Gal were discussing a local stage play, titled "Wellstone", about the life of Paul Wellstone. Ma made sure to mention that Wellstone "was killed in that plane crash" before his third Senatorial re-election attempt. Now what an absurd and ignorant statement to make. The NTSB found no evidence - none, ZERO - that there was any foul play in the Wellstone plane crash. The NTSB, in fact, ruled the crash due to the "flight crew's failure to maintain adequate airspeed, which led to an aerodynamic stall from which they did not recover." Somehow, in their sick, twisted, polluted and conspiratorial minds, the Left adamantly believes that Wellstone was killed when no evidence exists to prove it. But the Left somehow has convinced themselves that Vince Foster wasn't killed. The Left believes that before getting out of his car, Foster removed his shoes and walked stocking footed through Ft. Marcy Park and then, just before committing "suicide", put his shoes back on. That's a likely and believable scenario, isn't it? Well, Maaaaaaa, Paul would still be around if only he hadn't lied. Wellstone repeatedly promised that he would only serve two terms. He lied. He then sought a third term. Had he kept his promise to not seek a third term he never would have boarded the doomed flight that killed him and all others on board. Anyway...HAPPY COLUMBUS DAY, people...HAPPY COLUMBUS DAY ! 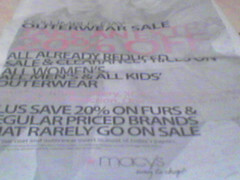 And if you weren't aware of it, Macy's is having an Outerwear Sale today. A Columbus Day Outerwear sale! Make sure your brains are loaded before you shoot your mouth off. All state workers were at the trough yesterday. Stop interfering in my Right Wing Propaganda Machine with facts otherwise Rove will boot me off the payroll !! !